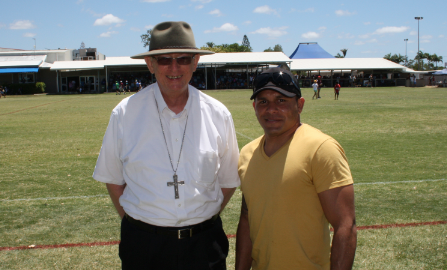 Kicking goals: Bishop Michael Putney and former North Queensland Cowboys National Rugby League player Matt Bowen at the recent All Blacks Indigenous rugby league carnival. BISHOP Michael Putney has kicked many goals in his 12 years as Townsville’s bishop. Recently an award presented at the All Blacks Indigenous rugby league carnival recognised his contribution to Townsville’s Aboriginal and Torres Strait Islander community. Bishop Putney said he was thankful for the award. “It recognises the continued relationship between the Indigenous people of Townsville and the Church,” he said. Twenty-two teams contested the A-grade division, while teams also played in the Under-19 and masters divisions in the event held at the Brothers Leagues Club earlier this month. Organisers estimated 8000 to 10,000 people attended the carnival over the two days. Former North Queensland Cowboys National Rugby League player Matt Bowen was also recognised by the organisers for his contributions to grass roots rugby league as a role model for Aboriginal and Torres Strait Islanders.